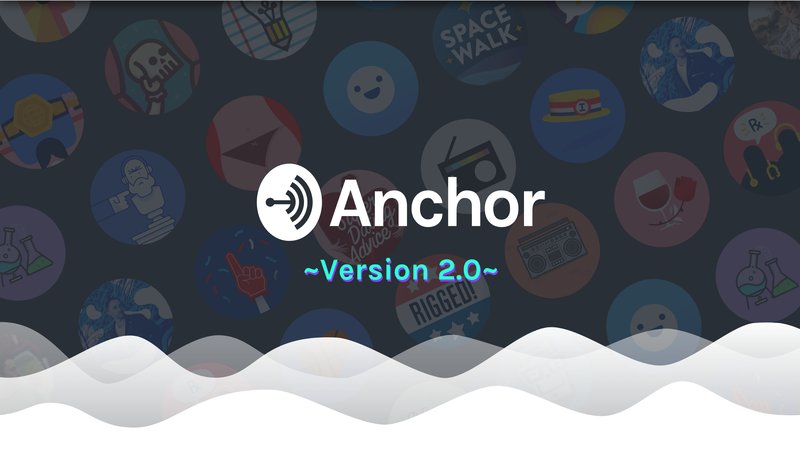 Today, we’re unveiling version 2.0 of the Anchor platform, making it easy to create a brand new type of radio, available everywhere audio is heard. The new Anchor lets you broadcast your voice, clip external sound bites, mix in full length tracks from Apple Music and Spotify, take call-ins from your listeners, and add interludes created by world class sound designers and musicians, all from your phone. Plus, everything on the new Anchor can be heard on iOS, Android, Amazon Echo, Google Home, web, and in your car via Bluetooth. We’re also excited to announce a new, $2.8M round of funding, led by our new partners at Accel along with The Chernin Group, Omidyar Network, Mick Batyske, and previous Anchor investors Eniac Ventures. All of this helps us continue our mission of reinventing radio, by bringing effortless audio creation and distribution to anyone who wants to have their voice heard. 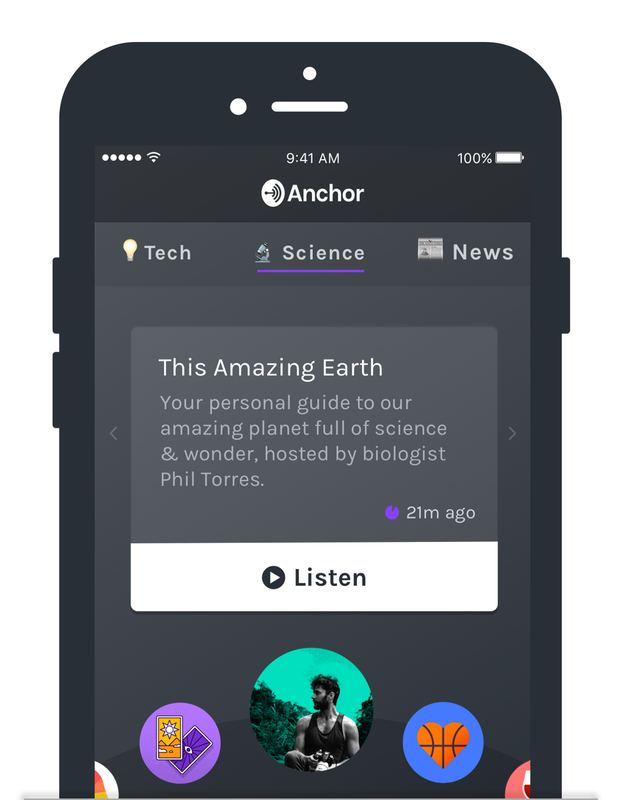 Just over a year ago, we launched Anchor 1.0, combining easy production, social networking, and a totally new way to distribute audio. From the day we launched, we witnessed people from nearly 200 countries recording audio daily. Our team is still blown away by the funny, heartfelt, honest conversations we witnessed between strangers, and by how often they came back. Some of our favorites are the exchanges between people from all walks of life who never would have spoken to one another before Anchor. Fueling this type of interaction continues to be incredibly gratifying work. The experience confirmed two very important ideas: (1) if given the proper tools, non-professionals from all over the globe will create audio, and (2) audio can be social. But we also learned that audio from a microphone wasn’t enough. We saw creators going to extreme lengths to inject boundless creativity into their recordings, pulling in external music and audio clips, interviewing fascinating people — everyone from A-list Hollywood directors, to people on the sidelines of war in Syria — to make sure the story they wanted to tell could be heard how they wanted it to be heard. We also saw creators using tags and replies to organize their content in a more structured format versus an ad hoc stream. Without realizing it, our community brought us back to our original mission of democratizing radio — a medium that is still being consumed by over 90% of Americans weekly — and the medium we’ve be aiming to reinvent since the day we wrote our first line of code in a tiny, New York City apartment. We’ve always loved the many unique qualities of audio — like the way it enables you to consume anywhere, multitask while listening, and hear emotion often lost in text and even video. Audio is the only creative medium that hasn’t yet been modernized for the twenty-first century. Today we’re taking the next step on our journey to reinvent radio with a brand new experience for creating, listening, and sharing. In the new Anchor, everyone has a station: a place for you to broadcast a stream of bite-sized audio. One of the standout features of Anchor has always been our unique telephone mode recording, which lets people record while holding the phone to their ear — just like talking on the telephone — then edit it with high quality background music. It’s still just as easy to record your voice with the new Anchor and add it to your station, but we’ve also included a set of brand new audio production tools that make it easier to create compelling content. Add external clips to your station, giving you the ability to showcase news, quotes, and sound bites. President Trump had a press conference today? Pull in a clip of one of his quotes, then add your perspective. We saw a lot of people doing this manually in Anchor v1, but we’ve made it seamless by building the process right into the platform. DJ a real music station by mixing in full songs from Apple Music or Spotify, then add commentary to tell your listeners why those songs made it on your playlist or to add some background about the artists who made them. Take call-ins from your listeners, then pull your favorites into your station. Replies were a fun way for users of 1.0 to host interactive voice conversations, but the added ability to curate makes for a much better listening experience. Transition your segments with high-quality interludes designed by world-class musicians and sound designers. Sounds of rewinding vinyl records, mellow guitars, and futuristic fx will help your station achieve the exact vibe you’re imagining in your head. Within seconds of using the new version, you’re on the air, broadcasting professional-sounding audio to your listeners. To start hearing audio you’ll love, check out the app’s new Dial. You’ll find stations from some of the world’s most well-known publications and media companies like Gizmodo, Jezebel, Lifehacker, WNYC, The Outline, The Infatuation, IGN, Backchannel, Big Beat Records, JASH (a comedy company founded in partnership with Sarah Silverman, Michael Cera, Tim Heidecker & Eric Wareheim and Reggie Watts), and others to help fuel your new daily listening habit. You can also check out the Anchor Rundown, a personalized, A.I.-powered station that’s designed just for you, featuring up-to-the-minute news and weather powered by Dark Sky. Entomologist and television host Phil Torres takes a daily break from his world travels to bring you a first-hand look at life in the jungle. Astrophysicist Lucianne Walkowicz delivers fresh broadcasts from the universe to teach you everything you ever wanted to know about space. Former Bachelorette contestant and current after-show host Brooks Forester gives you unheard-of behind-the-scenes access to the world of the Bachelor Nation. Sirish Kondabolu and David Benavidez are two young doctors who carefully craft a daily mixtape to teach you about their two passions: medicine and hip hop. Ashley Bezgin, a NYC comedian best known for her outrageous outfits, gives you dating advice she totally doesn’t follow but you probably should. LA comedian and renaissance man James Andre Jefferson Jr. tells it like it is… about whatever he feels like. We dare you to make it through this station with a straight face. Award-winning podcaster Tom Merritt gives you all the tech news you need each day in five minutes on Daily Tech Headlines. Anytime you hear something you love, gently knock on the back of your phone a few times while it’s in your pocket to applaud the host (or you can tap the applause button if you’re looking at your phone). It’s a lot of fun. This feature is currently only available for iPhone users, but we promise it’s coming to Android very soon. Meet Applause: a Like you can actually hear. We’ve also worked hard to finally make audio shareable on social media. Anchor instantly converts all recorded audio into rich, colorful videos that play seamlessly on Facebook, Twitter, YouTube, Instagram, and any other platform that supports video. The best videos will even feature built-in captions thanks to automatic speech-to-text transcription, powered by our partners at IBM Watson. This means you can consume Anchor audio outside of the app even when you’re not in a position to turn up your phone’s volume (like in class or a meeting). Over the next few months, we’ll be offering additional channels to view these videos as they’re created, including a Slack integration powered by Dexter. Anchor’s transcribed videos are the perfect tool for podcasters who want a new way to promote their audio on social media. 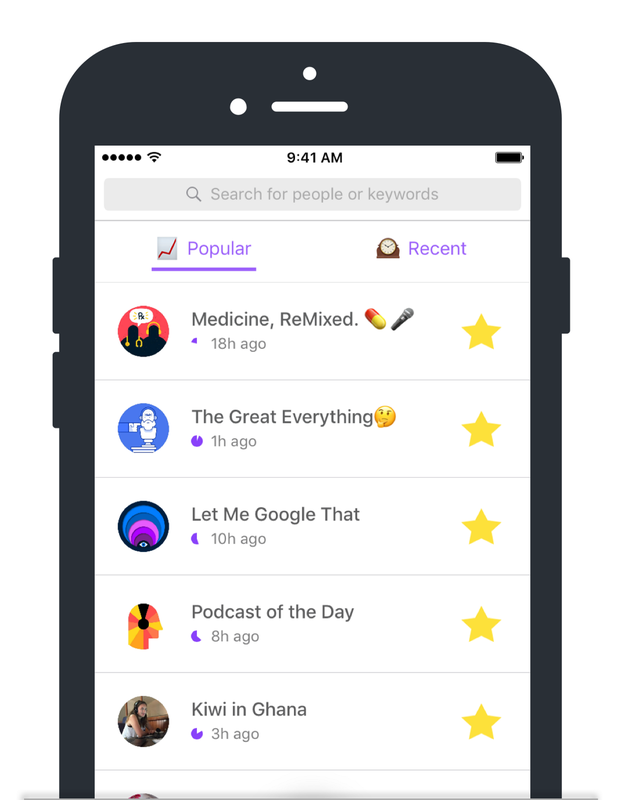 It’s never been easier to highlight the best clips from your episodes and have them heard in bite size chunks on Twitter, Facebook, and Instagram. So go check it out. Anchor is available to download right now for iOS and Android. You can hear it on your Amazon Echo by saying “Alexa, enable Anchor” or on your Google Home. We can’t wait to hear you and hear from you! Help spread the word about the new Anchor simply by recommending this article on Medium. All you have to do is tap the green heart below. Thanks for your support, it really helps! PS. Going to SXSW 2017? If you work in or with audio and you’re looking for a quiet space during the festival to do some podcasting, then come hang out at The Anchor Audio Lounge (pw: AUDIOFIRST) on March 13th. We’re also hosting a private party celebrating audio and voice interfaces and the people who create them, aptly called The Audio Party on March 12th. If you’d like to attend, please email sxsw [at] anchor [dot] fm to request an invitation.